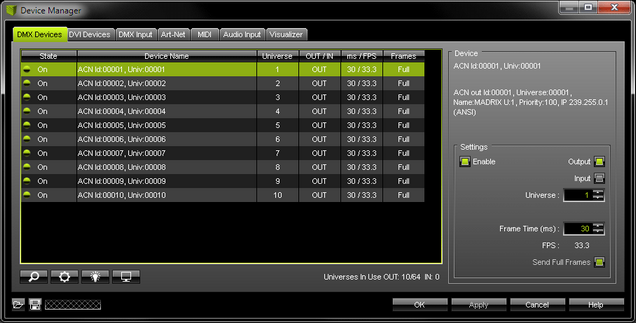 Streaming ACN [sACN/E1.31] is a protocol that transfers DMX data over Ethernet. It is another network-based DMX protocol. It is a standard created by ESTA [Entertainment Services and Technology Association; web link »www.esta.org]. There are several steps required to set up Streaming ACN products in MADRIX. This chapter is only part of the process. You need to set up other configurations as well [such as virtual LED matrix, DMX Devices, MADRIX Effects, Audio, etc.]. 1] Configure network settings in Windows. 2] Activate Streaming ACN in MADRIX. 3A] Configure single DMX devices. 3B] Configure multiple DMX devices. 4] Choose if you are going to use your devices as output or input interfaces. 5] Set up the correct DMX universe. 6] Set up the Frame Time. ▪ MADRIX automatically sets up Streaming ACN network settings for you. ▪ You only need a computer with a network card and a valid IP address. ▪ You do not have to change the IP address settings in Windows for Streaming ACN! ▪ The IP address range for sACN devices is 239.255.X.X according to the Streaming ACN specifications. ▪ Make sure that your Firewall does not block data of the 239.255.X.X IP address range! ▪ Choose your network card from the drop-down list. Make sure to select the correct network adapter that will be used for Streaming ACN! ▪ ACN Device Count - Set up how many you are going to use. ▪ ACN CID - Being a network protocol, Streaming ACN sends a so-called CIDs [Component Identifier]. - Every single ACN device has such a unique ID. 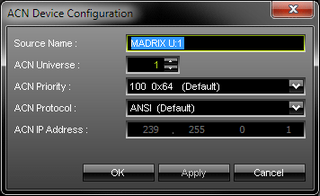 - When using Streaming ACN, your MADRIX software is one of those devices. - When you start MADRIX for the first time, this ID will be generated automatically for you. From this point onwards it will be used on your PC. - With this ID your MADRIX software can be easily identified in the network. Interfaces can detect this unique ID and can be configured to receive data from this particular device. Please note that the ACN interface must support this feature. - Do not change the ACN CID, unless you are an experienced user! ▪ Press OK to close the window. 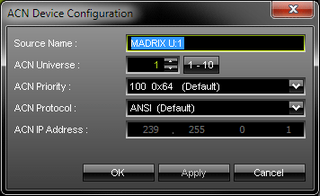 ▪ MADRIX automatically creates and adds the number of interfaces to the list. ▪ Source Name - Allows you to set up a specific name for the device. This name is send via network as well. Therefore, interfaces may be able to retrieve this name and can be configured to receive data from this source. - If you are using the default name MADRIX U:X, the universe will automatically be displayed in the name [represented by X: 1, 2, 3, etc.]. ▪ ACN Universe - Defines the DMX universe of the device. - Set up the same universe that is set up in your sACN device. - According to the Streaming ACN specifications, MADRIX will automatically change the ACN IP Address according to the ACN Universe. ▪ ACN Priority - Was implemented for backup solutions. Valid values range from 0 to 200, which is the highest priority. - For example, you may have set up two MADRIX PCs. One gets a priority of 100. The second PC gets a priority of 50. If the first PC fails and only if it malfunctions, data will be automatically received from PC #2. - Data will always be received from the device with the highest priority. Please note that the ACN device must support this feature. ▪ ACN Protocol - Allows you to choose the protocol version. The official version is called ANSI. This option is selected by default. - If you are using an older device that is using the Draft version, you may select BSR. - Do not change the protocol unless you are certain. ▪ ACN IP Address - Displays the IP address of the device as automatically assigned by MADRIX according to the Streaming ACN specifications. The last 2 digits match the assigned DMX universe. ▪ Press Apply to confirm your changes. ▪ You can configure several interfaces at the same time. ▪ Set up the settings as described under 3A]. Leave this button deactivated and every device will get the same number of universes. Activate the button and MADRIX will automatically increase the number for all the selected devices, starting with the ACN Universe value you entered. ▪ Make sure that your device is still selected under Preferences > Device Manager... > DMX Devices. ▪ In DMX-IN mode, you will not be able to select the ACN protocol. MADRIX will automatically select the correct protocol version. ▪ Note: If you are loading a MADRIX Setup, please check if the number of ACN devices in your setup corresponds with the number that is activated. The Setup stores the number of devices. But if you changed the amount and then loaded the Setup, the newly defined number will be activated. Highlight - Activates the highlight mode for the selected interface and universe. Select one or more interfaces and click the button. The corresponding fixtures at the selected interfaces will flash for a better identification or tests. This makes it easier to see them on stage. It considerably speeds up the procedure of programming or testing the selected DMX512/Art-Net interfaces. ▪ Please switch off your Firewall or configure your Firewall accordingly. sACN might not work with a Firewall! ▪ It is recommended to run sACN in a separate network without internet access. Else, the internet connection may not work properly. ▪ When using a network-based output protocol and when the startup option Start MADRIX After Booting Windows is used, it is highly recommended to also activate the Startup option Start With Timeout (s) with a value of 30 or higher. ▪ Make sure that sACN is set up as an individual network and separate from the Internet. ▪ Double-check if routers and switches in the network allow communication and IP address forwarding for the 239.255.X.X range of IP addresses. ▪ Double-check if your sACN devices support multicast Streaming ACN and are configured accordingly.